WASHINGTON, D.C. -- U.S. voters are about twice as likely to say their U.S. House representative deserves re-election (51%) as they are to say most members of Congress do (26%). These readings are similar to voters' opinions just days before the 2014 midterm elections and remain among the worst for incumbents dating back to 1994. Support for U.S. voters' own member of Congress in midterm elections has consistently been higher than support for most members over the years, even as the overall positivity toward both has fluctuated. 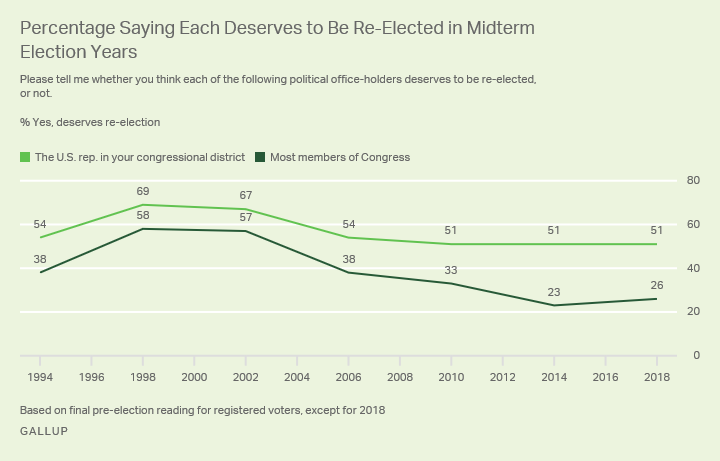 The reading for voters' own member has not fallen below 50% just before a midterm election since the beginning of Gallup's trend in the early 1990s. On the other hand, with the exception of the 1998 and 2002 readings, less than half of voters have supported the re-election of "most" members of Congress since 1994. The latest readings, based on an April 9-15 Gallup poll of registered voters, are in line with those from the 2010 and 2014 midterm elections. They are also similar to the 2006 findings, although the percentage for "most" members of Congress was higher that year. Republican voters, whose party has controlled both houses of Congress since 2015, are more likely than Democrats or independents to support the re-election of incumbents, both their own member and most members. This generally mirrors the most recent findings for overall congressional approval. While one-third of Republicans say most members of Congress deserve to serve another term, fewer Democrats and independents agree. In the 2014 pre-election poll, Democratic and Republican voters supported most incumbents in roughly equal, and low, numbers -- roughly one-quarter each said most members of Congress deserved re-election. Republicans went on to win control of the Senate and retain control of the House. In 2010, Democratic voters were more than twice as likely as Republicans to say most incumbents in Congress deserved re-election, and the Republicans recaptured the House. The opposite was true in 2006, when twice as many Republicans as Democrats said most incumbents deserved to serve another term. That year, Democrats regained control of both houses of Congress. In general, re-election rates of incumbent members of Congress are high, but there are fluctuations in how high. For the five midterms before 2014, in years when voters were less likely to say incumbents deserved to serve another term, the incumbent re-election rate in the U.S. House of Representatives was lower. The converse has also been true: when U.S. voters were more positive toward incumbents, incumbent re-election rates were higher. Yet the 2014 election did not follow the same pattern as the five previous midterms. In 2014, just days before voters went to the polls, less than one-quarter said most members of Congress deserved to serve another term. This was the lowest reading dating back to 1994. Historically, the expectation would have been for fewer incumbents to be re-elected, but 95% were. Republicans were able to build on the large gains they had made in 2010 and take advantage of President Barack Obama's flagging approval. And voter turnout in 2014 was the lowest since 1942. Aside from 2014, in the years when the public was least likely to say incumbents deserved re-election -- 1994, 2006 and 2010 -- the opposition party gained control of the House. Assuming the 2014 election was an outlier, the 2018 election is so far looking like the midterm elections of 1994, 2006 and 2010. Conditions in the U.S. are now similar to those years, with an unpopular president in office and his own party controlling both houses of Congress. These factors, along with a lower percentage of voters saying incumbents deserve re-election, could indicate that a wave election is brewing. 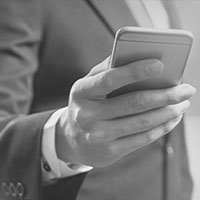 Results for this Gallup poll are based on telephone interviews conducted April 9-15, 2018, on the Gallup U.S. Poll, with a random sample of 1,510 adults, aged 18 and older, living in all 50 U.S. states and the District of Columbia. For results based on the total sample of 1,312 registered voters, the margin of sampling error is ±3 percentage points at the 95% confidence level. All reported margins of sampling error include computed design effects for weighting. Democrats looking for a midterm message beyond opposing Donald Trump have a number of traditional Democratic issues to choose from. Republicans' power issue with core Republicans is immigration. Eighteen percent of Americans approve of the job the U.S. Congress is doing, matching the average rating the current Congress has received since January 2017. Midterm elections are notoriously perilous for the president's party, and Trump's approval rating only makes matters worse. Can he produce another surprise?